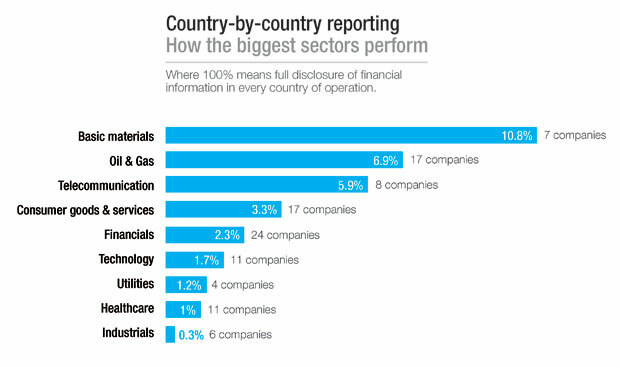 Our recent report on corporate transparency has exposed lamentably low levels of country-by-country reporting across the business spectrum. This means 69 of the world’s biggest companies operate in India, for example, but only two disclose how much money they made there, and not one discloses Indian tax payments on their main corporate website (see the transparency footprint in more countries on this map). Surprisingly, financial and tech companies were among the worst performers doing the least to disclose taxes, revenues and other financial data from the numerous countries where they operate. (Among the 24 financial institutions evaluated, 13 companies disclose no data on their foreign operations. Read a break down of the financial sector performance here). To put these low scores in context, Statoil scored 50 %. Clearly, it is not just the oil and gas sector that needs to do more disclosure. The European Parliament surprised us last week by taking a big step toward mandatory transparency requirements for all multinational companies. We had expected the vote to endorse strong rules obliging extractive companies to disclose payments to governments worldwide. Similar rules for extractive companies were agreed by US regulators in August. The rules have been long awaited since they will put deals between companies and local officials, such into the spotlight. For the first time local communities will get a clear picture of the revenues generated by individual mines or oil concessions. The Parliamentary committee’s recommendation to extend mandatory reporting to the telecommunications, construction and banking sectors was less anticipated – especially in view of the pro-business leanings of the majority conservative group in Parliament. Why pick on these sectors? The list of amendments that Parliament agreed gives no clues, nor has there been a formal statement on the subject. Transparency International research can shed some light. There is a fair amount of evidence that business dealings in these sectors are dogged by bribery and opacity. In our new survey of businesspeople, 35% said they had failed to win a telecoms contract because of a competitor paying a bribe. The new rules may also include construction, the sector where bribes are most often paid. “The banking and finance sector as well as forestry, oil and gas, and mining stand out as the four sectors for which improper contributions to high-ranking politicians to achieve influence is seen as noticeably more common”. Which makes it all the more worrying that about half of the world’s 105 biggest companies do not disclose information about political contributions. The same could be said for telecoms. Auctioning off licences for mobile phone services provision, for example, can bring huge windfalls to cash-strapped countries. Some big political corruption scandals involved companies using political influence to win a part in the rolling out of mobile phone infrastructure or services, from Ireland to India. Siemens – US $ 800 million in fines in 2008 for bribes paid across the world. Siemens recently settled charges of bribing Greek officials around the 2004 Olympics. Alcatel Lucent – paid US $ 137 million in fines in 2010, for among other things, bribes to win a cell phone contract in Costa Rica. Read more on these cases here. Large infrastructure projects generate tax revenues that can be a honeypot for corrupt officials all along the revenue chain. Banking and finance can also generate large amounts of public revenues – often the main source of income for the governments of small island countries that lack natural resources or established industries. This should be a source of concern for global companies, as well as citizens. Multinational companies find it increasingly difficult to monitor and control all aspect of their far-flung subsidiaries. HSBC’s recent money-laundering woes involving its Mexican operations is a case in point. More transparent reporting at the country level will improve the range of checks and controls on unscrupulous behaviour by local operations. How can mandatory country-by-country disclosures help? Corporate reporting will also help corporations win public trust and reassure investors increasingly concerned about local political risks. It will make governments much more accountable for the large sums of money these businesses generate. But we also need to recognise the limits of this legislation. Companies publishing information on their official payments to governments (taxes, royalties, one-off payments for signing contracts) will not eradicate a culture of graft in one fell swoop. That will require companies’ compliance with robust anti-bribery legislation such as in the US and UK and – beyond compliance – embedding a culture of integrity throughout the organisation. Country-level reporting does highlight the favourable fiscal terms that some companies enjoy, and may be an indication of an unsustainably cosy relationship with the powers-that-be. More transparency about political donations would also shed light on those occasionally fraught relationships. There will be some indication of the power and influence these sectors wield in the coming months when EU governments respond to the European Parliament’s proposals. They will formally consider them at a meeting in Brussels on 10-11 October. Will the proposals survive? You can leave your thoughts in the comments section below.